The stakes are high as Facebook gambles its messaging user base on a bet to beat Snapchat at its own game. Some people are downright pissed that Facebook would “ruin” Messenger by forcing messy social media into a clean chat app for a chance at glory and riches. Yet there’s an even bigger audience of Stories newbies available to be seduced by a convenient feature where they already communicate. The iPhone wasn’t the first smartphone. Apple waited for others to prove out the technology until the mainstream was ready, then invaded the market with something easier to use. Instagram Stories and Messenger Day have the same strategy. Here’s a breakdown of the case for and against Messenger Day, the Snapchat Stories clone Facebook launched last week. Users up for grabs – Hundreds of millions of people would likely enjoy the Stories content format, but aren’t already using Snapchat or Instagram Stories, especially internationally, where Snapchat has low penetration. Much of the backlash against Messenger Day seems to come from highly vocal early adopters already using other Stories products, who are actually in the minority. Messenger needs to make money – After pulling in a billion monthly users over the last six years, Facebook Messenger has only begun to experiment with sponsored messages and ad carousels. Facebook is running out of ad space in the News Feed, so it’s natural for it to be looking for ways to monetize its chat app. Burying ads in between Messenger Day stories could offer a less interruptive yet immersive format than letting business pay to ping you or taking up home screen real estate with ad blocks. Even if it decreases Messenger usage slightly, Day could make the app as a whole much more lucrative. People already share tons of content on Messenger – 17 billion photos are privately shared on Messenger per month, or around 566 million per day. Facebook thinks some percentage of these are fit for broadcasting, and popularizing its Messenger Camera through Day could get even more media sent in threads. People create 2.8 billion Snapchat Snaps per day, including 410 million photos, and Facebook thinks it can push Messenger content sharing to those heights. Messenger excels at content transmission compared to SMS, so it’s trying to hammer home this advantage as it seeks to defeat its biggest foe in the west: the status quo of text messaging. Differentiation through social gathering – One of the opportunities of connecting real-time, reverse chronological social media content with a messaging app is that it could let users broadcast what they’re doing or want to do, and then have friends privately message about joining them offline. Messenger’s “Who’s up for?” graphical filters and Active Now green dot indicators on Day posts purposefully encourage this behavior, which doesn’t fit naturally in the algorithmically sorted but often delayed News Feed, which is more about permanent, online-only content like link sharing and your best photos. So while Instagram Stories focuses on artfulness and classier stickers, Messenger Day lets you bombard your images with computer-generated filters based on your captions so you can communicate more complicated ideas visually. Consume while you wait for replies – By conveniently placing Day where people are already looking, Facebook can give you something to do while you’re waiting for friends to respond to messages. It also finally gives you a reason to open Messenger even if your friends aren’t chatting. With the right curation based on which friends you interact with most, and its big preview tiles Snap and Instagram lack, it could be an easy way to consume content from those you’re closest to. After all, Snapchat Stories was originally a social media product bolted onto a messaging app. Neuter Snapchat – Facebook sees Snap as its last true competitor in social media, and it’s willing to sacrifice some public opinion and usage by haters to offer a good-enough version of Snapchat Stories. 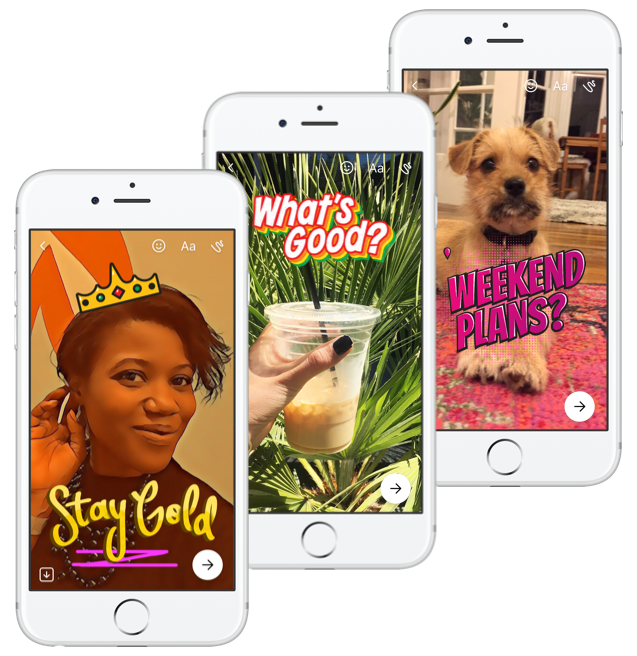 If Facebook can give people a more convenient way to share Stories through Messenger, just as it did with Instagram, it could cut off Snap’s most appealing growth mechanism. That could prevent it from parlaying its success in Stories into other areas like professional content distribution, which it’s already starting to do with Discover and Snapchat Shows like BBC’s exclusive Planet Earth II clips. Facebook is attacking Snap so aggressively now while it still has a big upper-hand. Polluting the purity of messaging – Messenger Day distracts from the core use case of private, text-based communication. Sticking Day at the top of the home screen both gobbles up space that could be used to show active threads, and lassoes the eyes to look at the content instead of the chats. Some people find it downright annoying. Redundancy – If people want to share photos and videos, they already can on Facebook, and can share them as Stories as on Instagram as well as Snapchat. Every app doesn’t need a Stories feature, and it fragments the audience so creators have to arduously cross-post multiple times to reach the maximum audience. No opt out – You can’t disable or hide Messenger Day, so if you just want to use Messenger for messaging, you’re out of luck. That could push people back to SMS, though other strict chat messaging apps have largely faltered in the West, and Facebook owns WhatsApp, which also has a Stories feature called Status hidden in a separate tab. Scary “add to day” buttons in threads – Messenger injects “Add to your day?” prompts inside your private threads when you share a photo or video. As M.G. Siegler pointed out, these are unsettling as users often share very private and sensitive media in their threads that they would never want broadcasted. At least you always have to confirm a second time that you want to publish the image, but these prompts still should be quieted down. Cloning could hinder Facebook recruiting – Who wants to go to work each day to copy Snapchat? Visionary product developers and designers may be repulsed by Facebook’s strategy of quickly cloning instead of innovating. Messing with Messenger to avoid cannibalizing News Feed – Facebook’s cash cow is News Feed ads. So while it might make more sense for a Stories feature to live in Facebook’s main content app rather than Messenger, Facebook might not be willing to risk changing News Feed usage that could disrupt its ad business. Overall, while Messenger is sure to anger some, the opportunity for Facebook and added value for users new to Stories outweigh the clutter, friction and poor optics. With a few tweaks, Facebook could soothe the irritation here. Minimizing the interruptive “Add To Day” prompts, and possibly even shrinking the Day preview tiles size for users who never open them would go a long way. A cross-post button to Instagram Stories could reduce the chore of reaching all your audiences. And highlighting the scale and AI-based filter of Day plus other more original product initiatives at Facebook could offset the recruiting detraction of being a notorious cloner. Perhaps Messenger Day does feel a bit forced down our throats, more to Facebook’s benefit and Snap’s detriment than users’ delight. But Facebook’s success in strict messaging and the plateauing of its competitors affords it the leeway to take a risk here. I’m already seeing solid use of Messenger Day by my friends, so perhaps this is another “1 million strong against the News Feed” or “I won’t download a separate Messenger app” situation where people end up liking or at least tolerating Messenger Day more than they expect.